I’ve been wanting one of these for a while now. 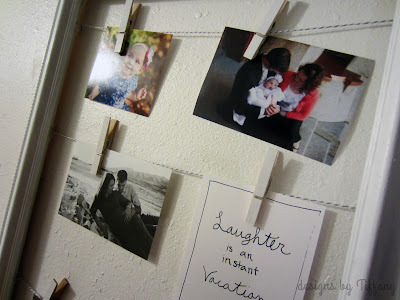 I love displaying pictures all over my house because pictures makes me happy! And this photo collage/gallery can display lots of pictures and quotes and makes it easy for me to swap out different ones. First off, I wanted it to be big in order to be able to display lots of photos. 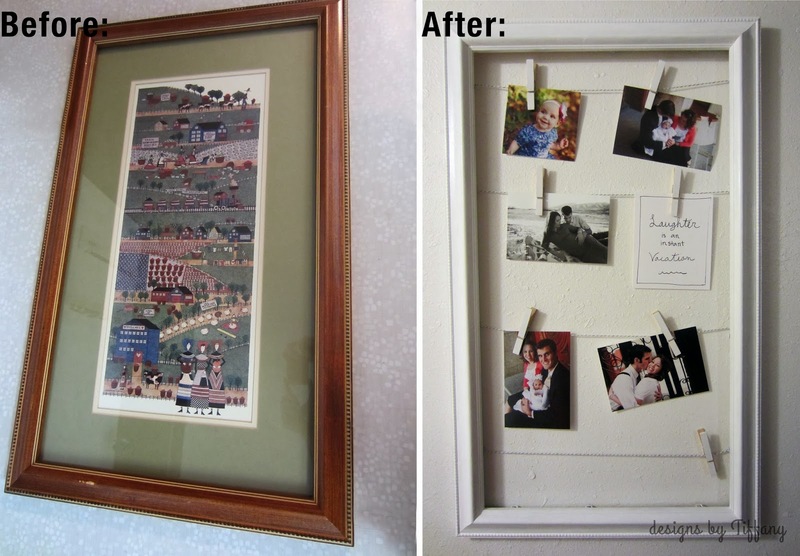 But, I didn’t want to pay $100+ to get a big frame… So I scored this custom frame at DI! Holla! The color and wood was actually kinda pretty, but I wanted it to be white so it wouldn’t distract from the photos. So I removed the backing and glass and painted it. After painting your frame the color of your choice, spray a clear coating to protect your mighty paint job. 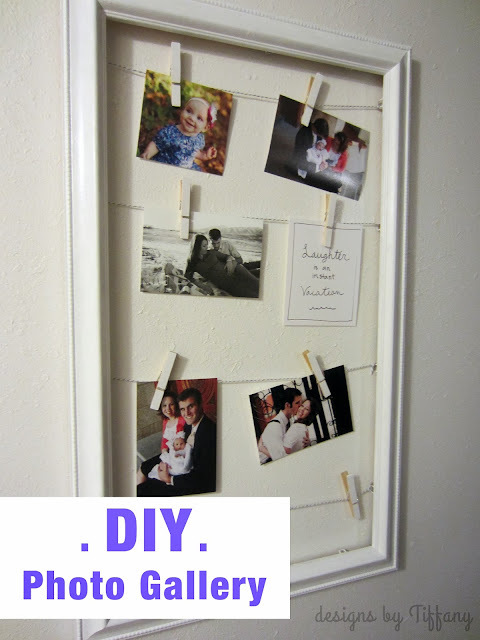 Then grab your twine and staple it to your frame. I don’t own a staple gun, so I just tied it to the frame backing staples, but I suggest stapling it if you can. Then, this is optional, but you can paint your clothes pins to match! Or be different fun colors. You decide. 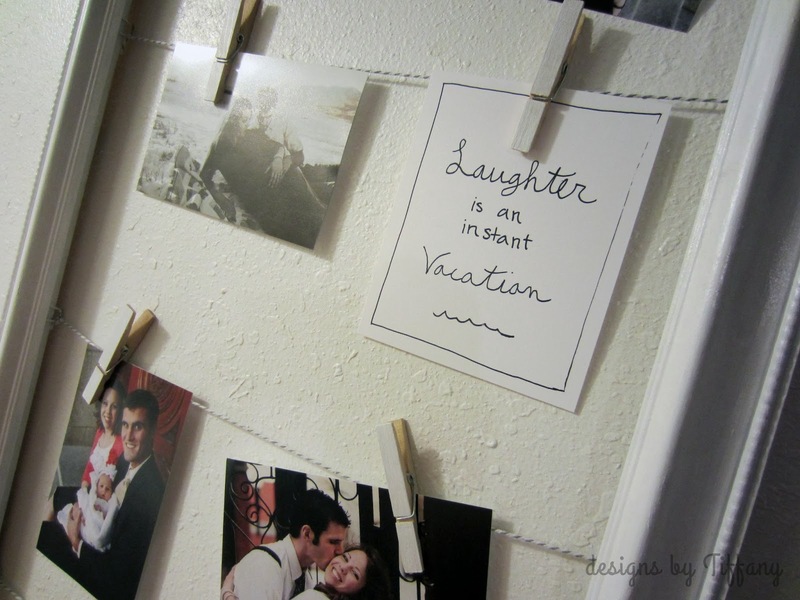 Then you’re ready to hang your frame and then tag on your photos and quotes! Enjoy! This turned out so cute, Tiffany! Such a good idea.